But now, there's an easier way. Deem's partnership with National Car and Driver allows travelers to book car rentals in China in minutes using Deem's Work Fource platform. Deem Work Fource brings beautiful design, machine learning and customization together to provide business travelers with a dynamic travel booking experience - including seamless bookings for ground transportation in China. 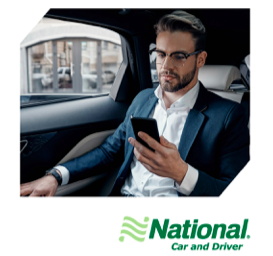 National Car and Driver is available for hours, days or weeks, including a wide range of vehicles to suit each traveler's needs, whether for business or pleasure. National's drivers will pick up at any location and take your travelers where ever they want to go. With GDS writeback and PNR integration, National Car and Driver bookings are added seamlessly into the PNR with air and hotel. Corporations and travel agents can track and service traveler's car rental booking when they're on the road – which means better service and greater comfort for the traveler. Executive assistants and travel organizers can easily book cars on behalf of the traveler, triggering itinerary confirmations to the travelers or other travel organizers. Travelers can easily add and cancel rental cars reservations via the mobile or desktop applications. And if a flight is delayed or cancelled the reservation automatically updates to accommodate the new itinerary.